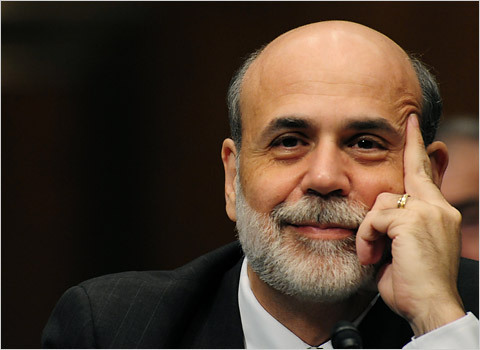 Fed Chairman Ben Bernanke calls it the “fiscal cliff.” It might be better thought of as the next economic Armageddon. Unless Congress acts to soften the blow, economists are warning that a looming year-end collision of massive, “automatic” cuts in federal spending and the expiration of sweeping Bush-era tax cuts could crush an already weak U.S. economic recovery. And unlike the central bank’s response to the Panic of 2008, the Fed would be powerless to offset the catastrophic impact on the economy and financial markets. "There is absolutely no chance that the Federal Reserve would be able to have the ability whatsoever to offset that effect on the economy," Bernanke told reporters Wednesday, following a two-day meeting of the Fed's policy-making committee. The risk of a potential economic train wreck stems from a series of contentious political decisions that Congress has been ducking for years, postponing a long list of tough choices until the end of the year, until after the national elections. Now, unless a compromise is reached, sharp cuts in federal spending will remove hundreds of billions of dollars from the U.S. economy, virtually overnight. At the same time, American consumers will see a massive increase in taxes that will sharply curb their spending power, taking another big bite out of the economy. While it was ducking those big decisions, Congress has also punted on a series of smaller budget measures that will have to be decided by next year. Taken together, they add up to some big numbers. The lists includes two long-running budget items that have become a popular perennial target of political horse trading. One is the now-annual "fix" to scheduled cuts in Medicare payments that would reduce spending on doctors' fees by as much as 30 percent. The other is a so-called "patch" required to prevent the Alternative Minimum Tax from hitting an ever-wider swath of middle class households. Wage earners are also set to lose the payroll tax cut that expires at the end of this year. An extension of long-term unemployment benefits is also set to expire, which would further slash the amount of money flowing through the economy. Economists and budget analysts have offered up various estimates on just how badly the economy would be damaged if Congress fails to act in time. The combination of the tax increases and spending cuts would amount to more than $6.8 trillion over 10 years, according to the Committee for a Responsible Federal Budget, a non-partisan think-tank whose board includes former members of Congress and budget directors. The Congressional Budget Office predicted earlier this year that the full impact of those tax hikes and spending cuts would remove about 3.5 percent of gross domestic product, more than wiping out the current recovery. That would send the unemployment rate, which stood at 8.2 percent in March, to 8.9 percent by year-end and 9.2 percent at the end of 2013. Some economists argue the hit to GDP could be even greater. Morgan Stanley economist David Greenlaw figures the hit from the fiscal cliff would amount to more like 5 percent of GDP in 2013. Others, like Deutsche Bank economist Joseph LaVorgna, think those estimates are overblown, though his assessment assumes Congress gets its act together and steers away from the cliff at the last minute. But there's widespread agreement that if lawmakers ultimately pull a "Thelma and Louise," the economic impact of these tax and spending changes would be devastating if they hit all at once. As Congress quibbles bitterly over how to cut the federal deficit, lawmakers generally agree that failing to do so would have dire long-term consequences. But, as Bernanke told the House Oversight Committee in March, balancing the budget abruptly would be even worse. "It is important to achieve sustainability over a longer period," he told the panel. "One day is a pretty short time frame." Perhaps even more worrisome than the scheduled "cliff" in federal taxing and spending is the timetable lawmakers face to prevent the worst-case scenarios from playing out. Given the potential changes in party leadership for both Congress and the White House, chances appear slim to none that any decisions will be made until after the November elections. That leaves Congress and the White House roughly eight weeks - punctuated by the Thanksgiving, Christmas and New Year's Eve holidays - to prevent the economy from falling off the cliff both sides have created. The deadline could be even tougher to meet if, as some are warning, the government runs out of borrowing authority in the middle of that eight-week window. Though the exact timing is difficult to predict, the next expiration of the current debt ceiling will likely spark another round of brinksmanship reminiscent of last August, when Congress and the White House narrowly quelled a rebellion by House Republicans bent on forcing the U.S. Treasury to default on its debt. That compromise produced the "automatic" $1.2 trillion spending cuts set for early next year. "Finding a clever way to kick the can down the road again is becoming a bigger and bigger challenge," Princeton University economist Alan Blinder wrote in a recent Wall Street Journal OpEd. "And Congress has barely coped with previous such challenges."